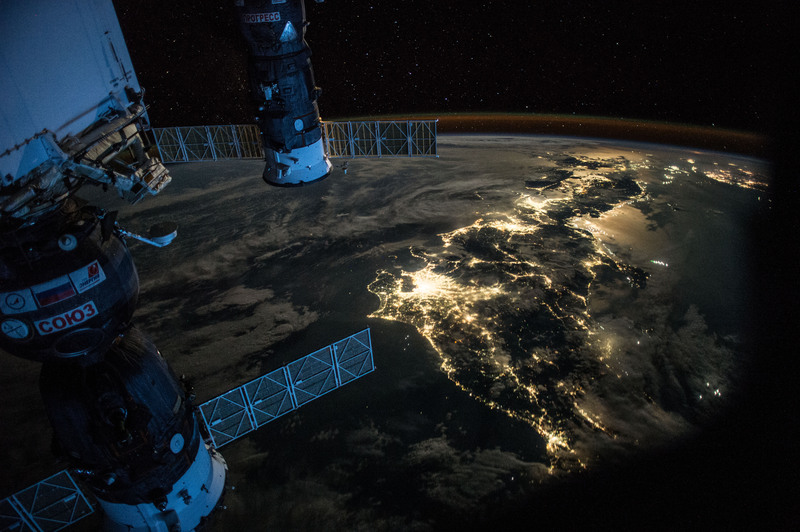 Explanation: Looking toward the south from an altitude of 400 kilometres, this stunning snapshot from orbit finds bright lights of Tokyo and cities across central and southern Japan, planet Earth shining upward through broken clouds. The spacefaring perspective was captured last July by astronaut Scott Kelly during his stay on board the International Space Station. Thin stripes of airglow follow the curve of the planet's dark limb, while beyond lie stars of the constellation Centaurus and the southern sky. Their solar panels extended, a docked Soyuz (bottom) and Progress spacecraft are posed in the foreground. Kelly returned to planet Earth this week after his one-year mission in space.